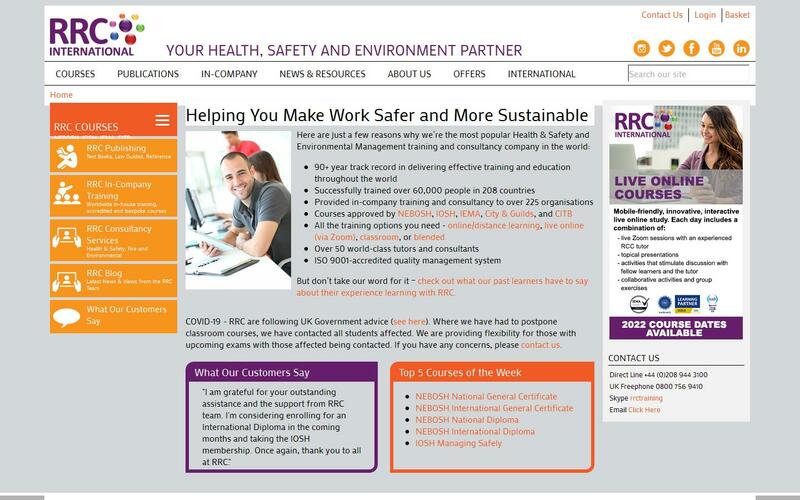 RRC is the largest UK-based international provider of health, safety, environmental and quality management training, including courses accredited by NEBOSH, IOSH, IEMA,CIEH, IOA, ConstructionSkills and CQI, as well as a range of short courses designed to meet specific training needs. Established in 1928, we have a reputation for excellence throughout the world and pride ourselves on providing the highest quality training and service. Whether you're looking for professional training to further your career, or your company needs a cost-effective way to deliver health and safety training to large numbers of staff, we have the solution you need. Quality is key to all our training provision, with exam results, completion rates and customer satisfaction at the heart of our quality management system. This is backed up by our 30-day money back guarantee on our distance/e-learning courses, which demonstrates the confidence we have in the excellence of our courses and our health and safety qualifications.